HAVE YOU SEEN OUR BRAVE PARTY??? CLICK HERE TO VIEW!! OUR BRAVE BEAR CLAW CUPCAKES – CLICK HERE TO VIEW!! All of the files will be sent to you via email by links to download your files. One lucky winner! You can earn up to 9 entries into this giveaway buy doing the various Entry Options. Contest starts today 2/21/2013 and ends at 12:00am 2/28/2013 EASTERN TIME. Winner will be contacted with in 48 hours from the time the giveaway ends and will have 48 hours to reply or a new winner will be chosen. We will have the files customized and emailed to you with in 72 hours of your final email for customizing. We are so excited to offer this since this is our most popular party right now our fans are searching for!! I’m planning a brave party for my daughter next month! This would be perfect timing! My 3 children. Thanks for the giveaway. for my cousin daughter on august and for my daughter on november! awesome giveaway! thanks a lot! Planning a Brave party for my soon-to-be five-year-old daughter. Love them. Can I just purchase them? I am planning my daughter’s 4th birthday party, and she LOVES the movie Brave! I am having it at a kid’s museum and am totally loving all the Brave accessories that I am seeing all over the interest! Love these!! Really look great since my little one is Brooke also!! Can I buy any of the above sheets for a March 2 party? Can I purchase the printable pack? If so please email with what I need to do. I’m planning a Brave themed 5th Birthday party for my little red-head! These printables would be perfect! These printables are great! My daughter is turning 8 in March and I can’t believe how fast the time has gone. I’ve got a ton of work to do to get ready for her party and these printables would be a SUPER huge help! Great ideas all around for the party…although I don’t think we’ll be wearing swimsuits and squirting each other with waterguns quite yet…it’s 33 here in WI and were expecting some snow later today!!! My daughter who is also turning 8! Planning a brave party for my soon to be 4 year old daughter! Love all of your ideas! I love the super cute Brave printables! We are planning a Brave party in a few weeks for our daughter Caley who is turning 5! Cant wait to make the bow and arrows! Thnks for sharing the blog with the instructions! I am planning a brave party for my daughter Olivia! This would be so awesome to win! I am planning a 3rd birthday party for my turner who loves Merida! Is it possible to purchase the pack, and if so, how much would you charge? My daughter’s 5th birthday is coming up soon. Thanks! Could I purchase the printables pack? I am planning my Niece’s 1st Birthday & I would like to have the Brave party printables. Is there a way I may get them or purchase? please. 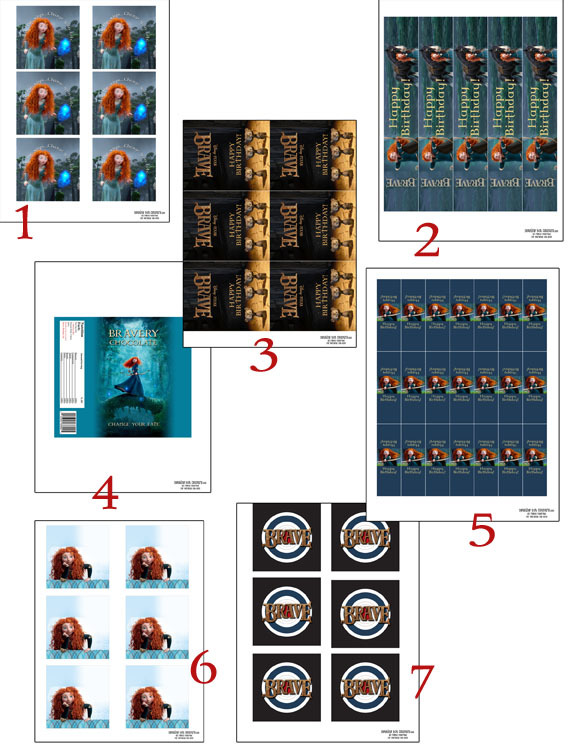 Is it possible to purchase your Brave printables? Hello. Is there a way to get the printables? I missed this contest. Thanks. Hi! I love everything you did for your “Brave” party. I am wondering if there is a way I could buy the printables from you to print for my own treats for my daughters upcoming 5th birthday party at the end of the month. Do you sell the files on Esty at all or is there a way I could work with you to get some of the files? Thanks so much! Is it still possible to purchase these printables? Hi! Love all the awesome ideas! Would you be willing to sell your printables? I would love to be able to use for my daughters party this weekend. Thanks!! Do you have the Brave printables for sale? cost? We are planning a Brave themed birthday party and really like the ideas you used. Just found this on Pinterest. The party is this Saturday. Thanks!